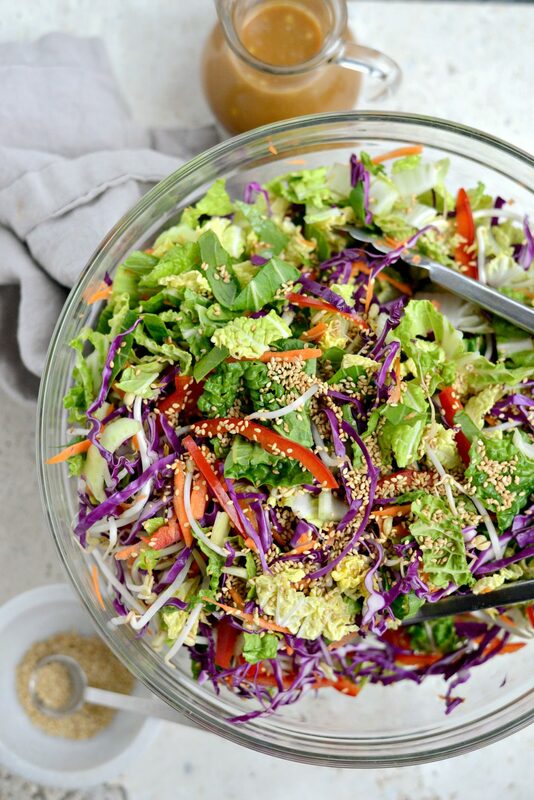 This delightfully Crunchy Asian Veggie Salad has plethora of colorful, crunchy and nutritious veggies like both Napa and purple cabbage, bok choy (love! ), sweet bell pepper and carrots are sliced and tossed with bean sprouts, green onions, peanuts and sesame seeds. 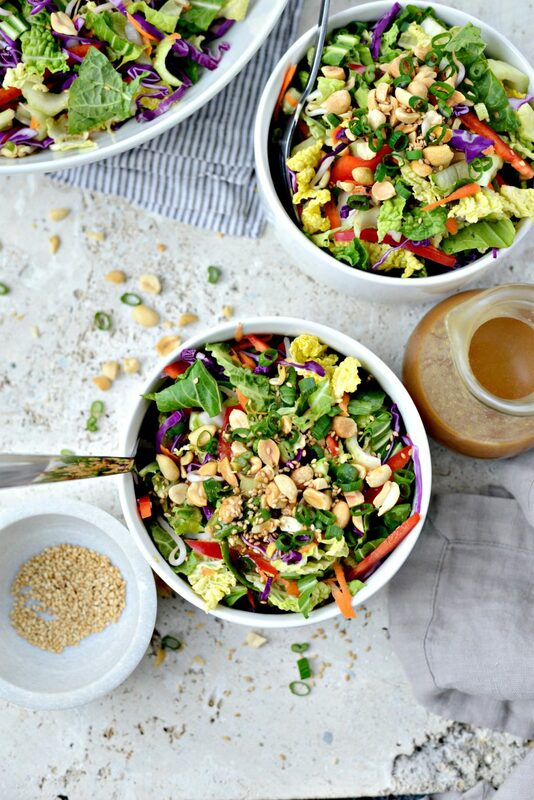 Finally this beautiful salad is drizzled with the most addictive honey ginger peanut dressing. 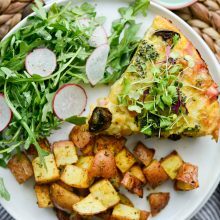 This recipe makes a big salad so it’s great for parties, gatherings or for a weeks worth of salad for lunch! What a week! How is it Wednesday already? Forget that, how is it March already? 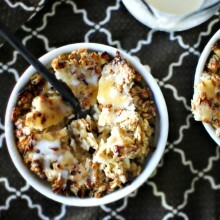 Wasn’t I just posting Holiday recipes, like yesterday? I can’t get over that my kids have only a trimester left and then summer vacation. What-the-what? This is the most grueling time of the school year; final exams, both girls trying out for sports –Malloree was asked to try out for the 8th grade team and Haileigh was asked to pitch for her JV team. And of course the weather is hit or miss. Currently if still feels a bit like winter here in the mitten, super windy and cold but I’m loving that it’s getting light around 7am and dark around 6:30pm. More sunlight = a happy me. I’m totally content with temperatures in the 50’s… just no snow please and thank you. Speaking of a happy me. Veggies. Especially in salad form make me happy! Monday through Friday I try to eat a salad for lunch. Not your basic salad –iceberg, tomato, cucumber etc.– but a salad that packed with colorful goodness. A few months ago I jotted down the idea for this salad: cabbage, carrot, green onion and some kind of peanut vinaigrette, was pretty much the jist of my inspiration for this recipe. When I was looking back through my spiral bound notebook for something to make, I decided to expand on this thought/recipe and make it better, more colorful. So I threw in two kinds of cabbage, sliced baby bok choy –which is GREAT raw and in salads– and made a honey ginger peanut dressing. 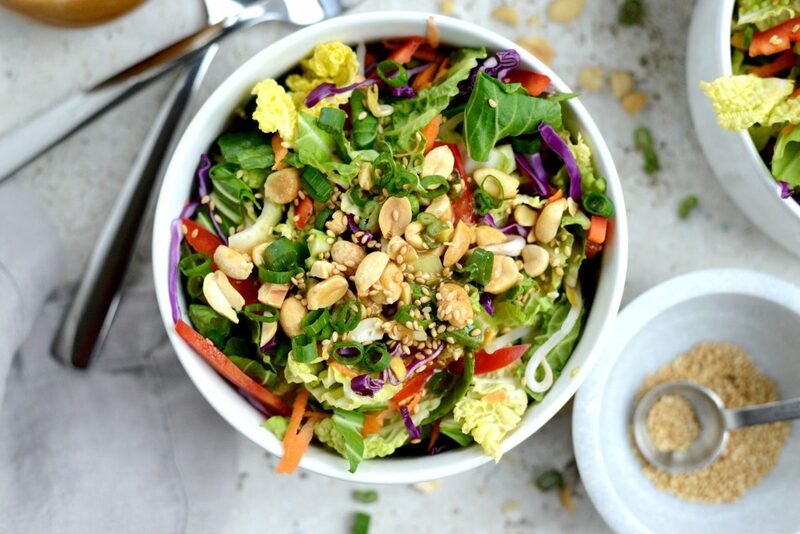 If veggies are your thing like they are mine, this crunch Asian vegetable salad will not disappoint. And the dressing?? Amazing. 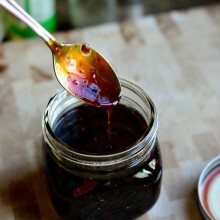 Now for the honey ginger peanut dressing… did I mention it’s amazingly delicious? Like restaurant quality. (toot-toot!) If you make Asian-inspired recipes, then you most likely have all the ingredients on hand. 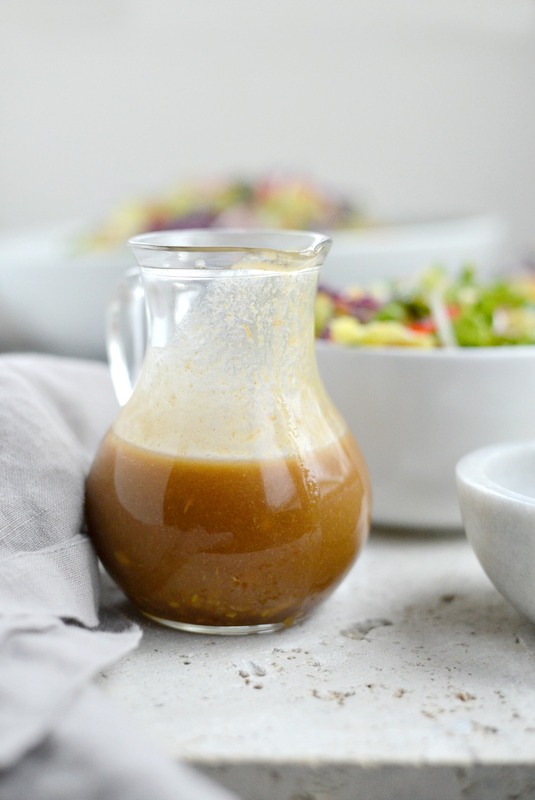 To make this dressing you will need: 1-1/2 tablespoons creamy peanut butter, 1-1/2 tablespoons fresh ginger (peeled and minced fine), 1 small to medium-ish clove of garlic, grated fine. 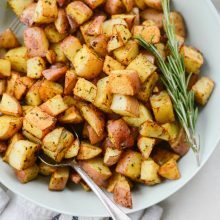 Also, 1/4 cup honey, 1/4 cup peanut oil, 1/4 cup (unseasoned) rice vinegar, 1 tablespoon low-sodium tamari (for gluten free) or low-sodium soy sauce, 1 teaspoon toasted sesame oil and 1/2 teaspoons kosher salt (more or less to taste). Whisk all of these together until smooth, set aside so the flavors can gel and then move on to the prep. Look at allthecolors! I’m a total freak about colors in a salad. I love a good rainbow mix of veggies, it’s satisfies my color OCD. In this gigantic bowl we have: 1 head Napa cabbage, 1/3 of a small head of purple cabbage, 1 pound (about 3) baby bok choy, 1 medium red bell pepper and about 3 green onions… all are sliced. You’ll also need 1 to 2 carrots, grated and 1 cup or so of (rinsed) bean sprouts. Use tongs to toss this all together with a tablespoon of toasted sesame seeds. 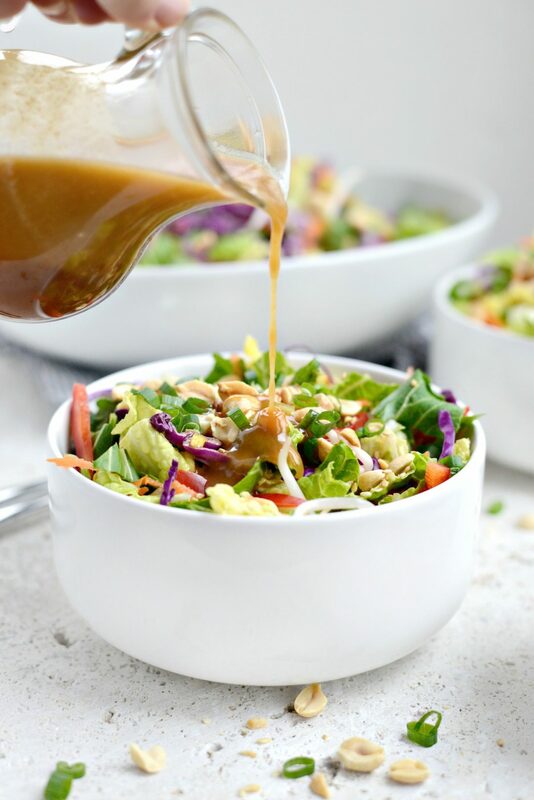 Divy up the salad among bowls and drizzle with the honey ginger peanut dressing. I top mine with extra peanuts, green onions and if I had any, chopped fresh cilantro leaves. 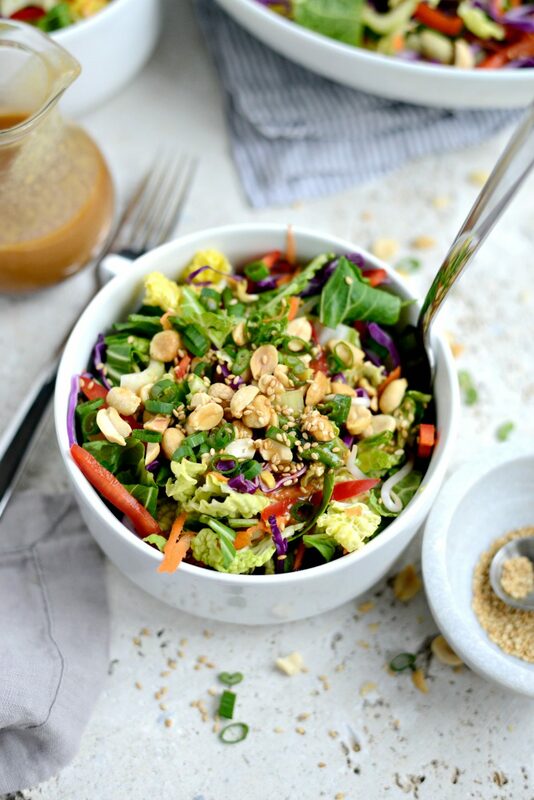 This crunchy Asian veggie salad with honey ginger peanut dressing is colorful, healthy, easy and delicious. To. Die. For. 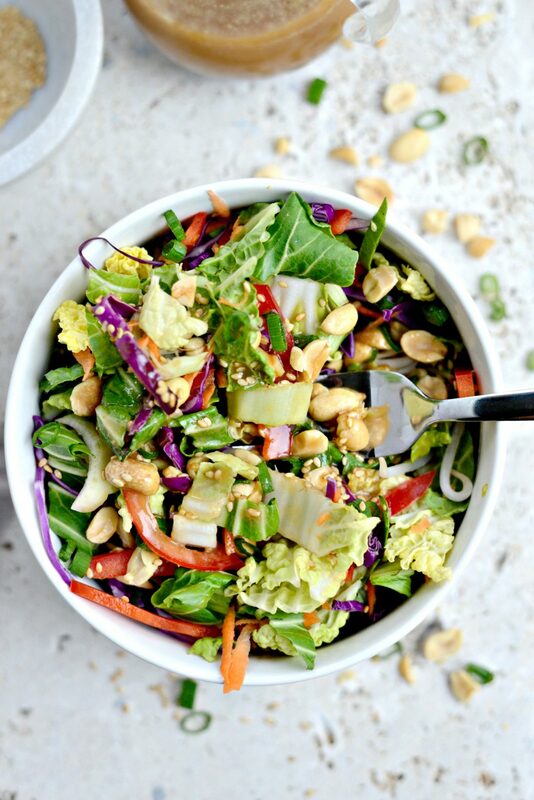 This crunchy Asian Veggie salad has TWO kinds of cabbage, sliced bok choy, carrots, peppers, bean sprouts and green onions, tossed with sesame seeds, peanuts and drizzled with a deliciously amazing honey ginger peanut dressing! 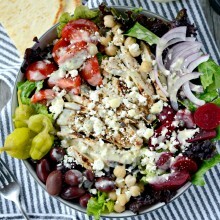 This recipe makes a big salad so it's great for parties, gatherings or for a weeks worth of salad for lunch! 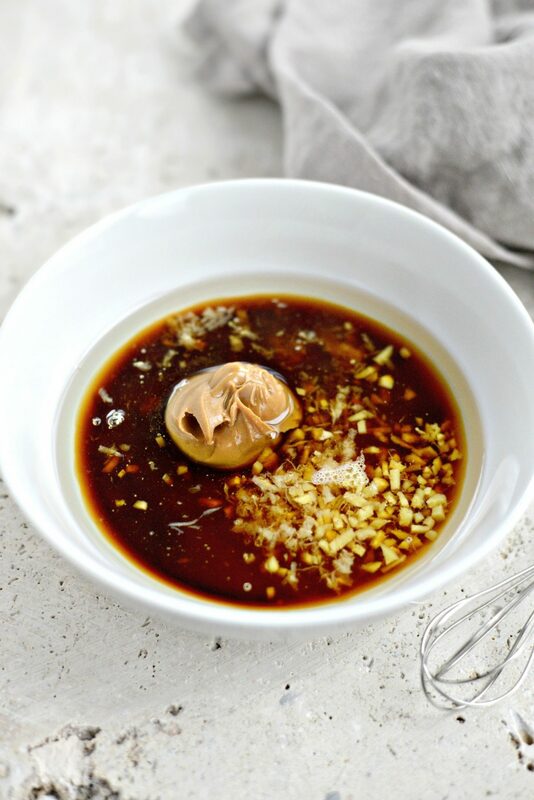 In a small bowl measure and add in the peanut butter, ginger, garlic, honey, peanut oil, rice vinegar, tamari, sesame oil and salt. Whisk until smooth and all of the ingredients are incorporated. Set off to the side so the ingredients can gel. 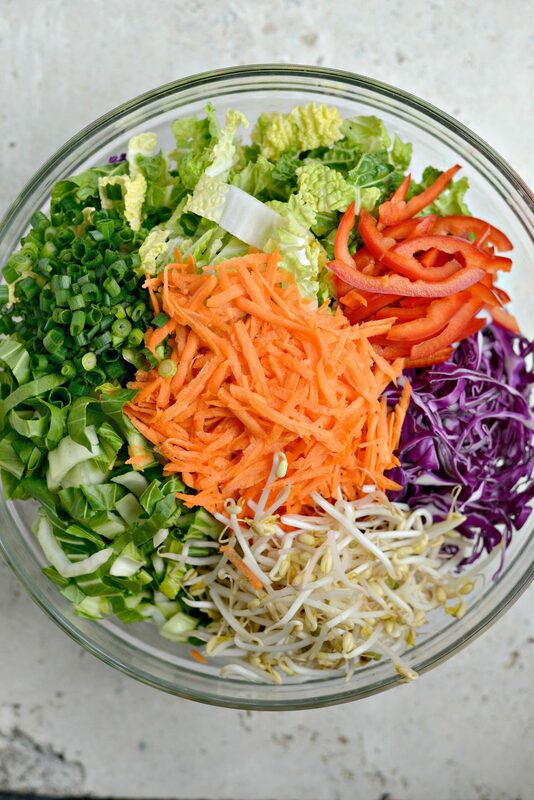 In a large mixing bowl combine the cabbage, baby bok choy, bell pepper, carrots, green onions, bean sprouts and toasted sesame seeds. Add in 3/4 cup of the peanuts and the chopped cilantro (if using). Toss more to combine, before divvying up the salad among plates (or bowls) and drizzling with the honey ginger peanut dressing. Serve with extra peanuts, sesame seeds, green onions and cilantro as garnish. 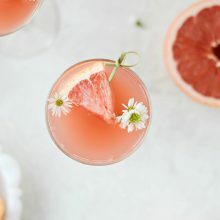 Making my recipe? I would love to see!! 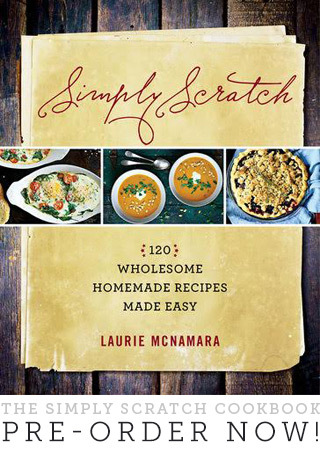 Don’t forget to snap a photo and tag @simply_scratch, #simplyscratchrecipes or #simplyscratch before posting to instagram, twitter or facebook (for facebook make sure to tag @simplyscratch)! Honey ginger peanut dressing lovingly adapted from Food.com.